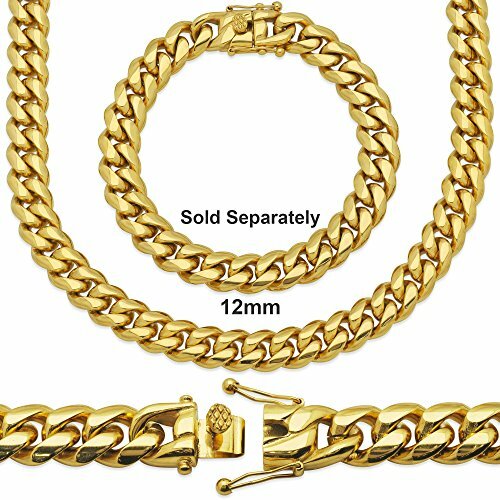 Stunning Stainless Steel Cuban Link Chain with 14k Gold Plating. Choose Necklace or Bracelet and add to cart individually. Not sold as a set. Not a set. Select length for chain, add to cart, then select length for bracelet, add to cart. EXCLUSIVE COLLECTION: Only available from Sterling Manufacturers. PERFECT GIFT FOR HIM: This cuban link chain is forever in style. Would make a perfect gift for a birthday, anniversary, or any special holiday. If you have any questions about this product by Sterling Manufacturers, contact us by completing and submitting the form below. If you are looking for a specif part number, please include it with your message. 14k Yellow Gold Twisted Cornicello Italian Horn Pendant with 1.2mm Singapore Chain Necklace - 20"
14k White Gold SOLID 1.5mm Diamond Cut Rope Chain Necklace with Lobster Claw Clasp - 20"